When we travelled in Spain before we saw hammams advertised. 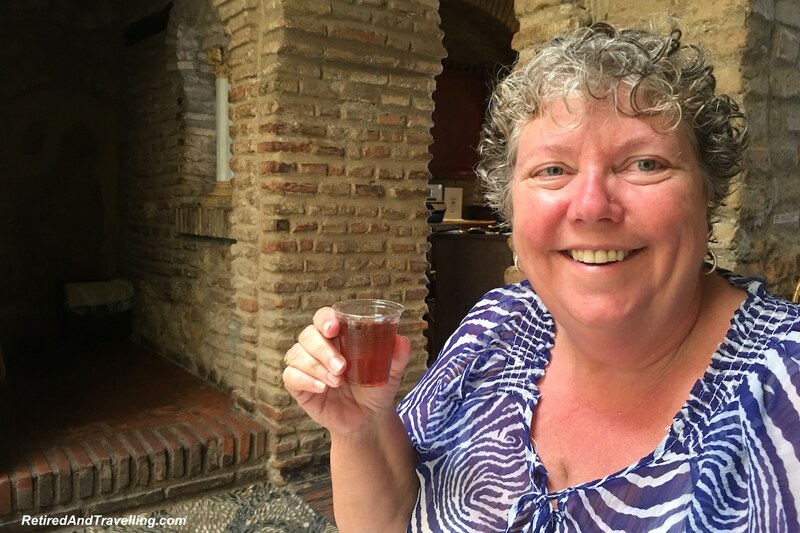 We missed our chance on our first visit to Madrid and we were far too busy on our short visit to Granada. 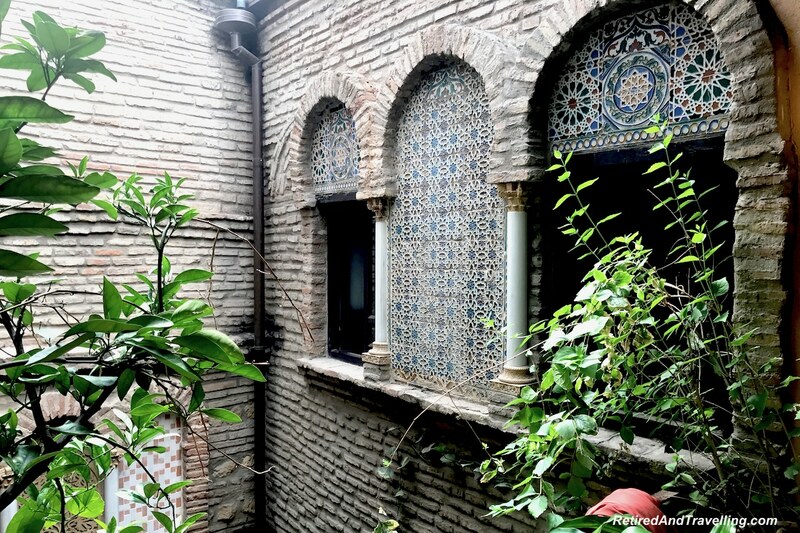 We didn’t visit a hammam when we were in Seville on this trip. 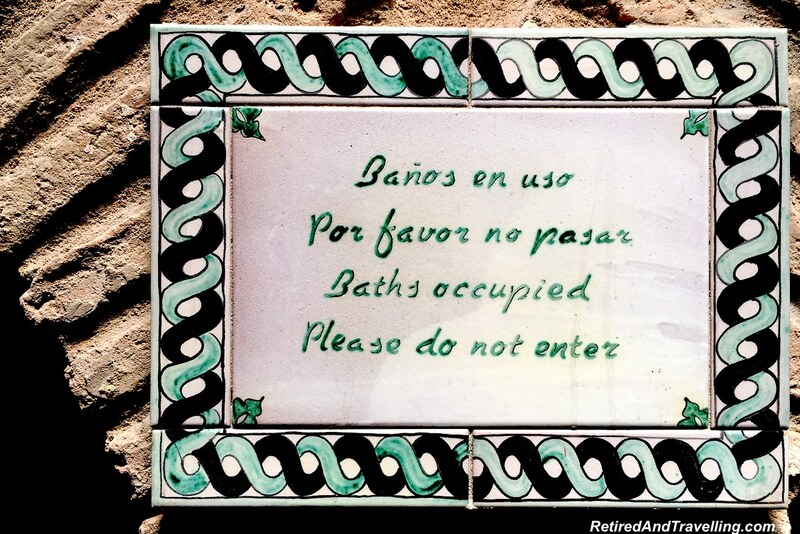 But we definitely planned to visit the baths at the hammam in Córdoba. 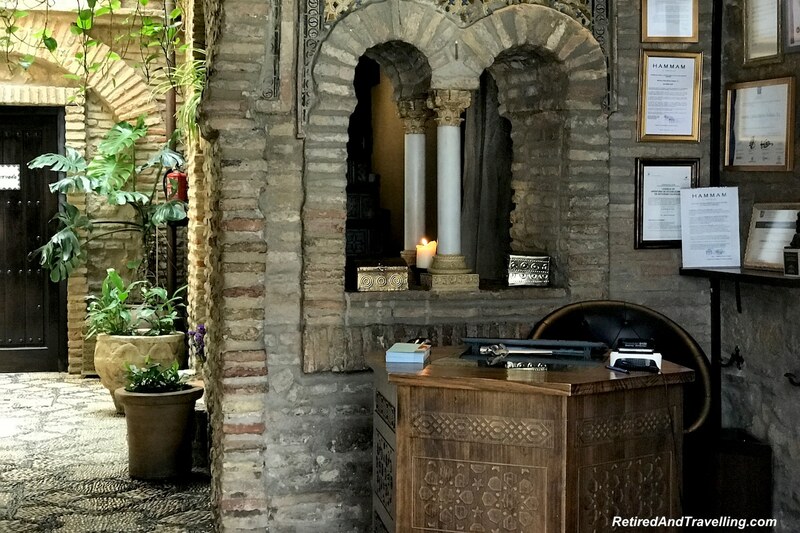 A hammam is a bath house modelled on ancient Moorish traditions. You can book 90 minutes in just the baths. This will let you move between cold, warm and hot baths. 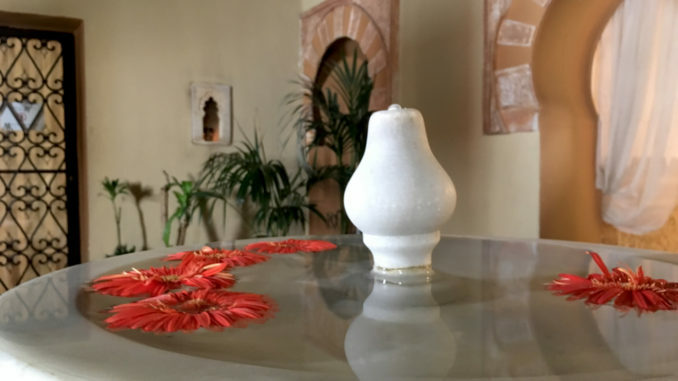 A Mimma service adds a massage and a Midra includes massage and a scrub on a hot stone table. We booked online at a promotion time that gave us extra massage time. I chose a Mimma and David did the Midra. This let us experience the full range of services. 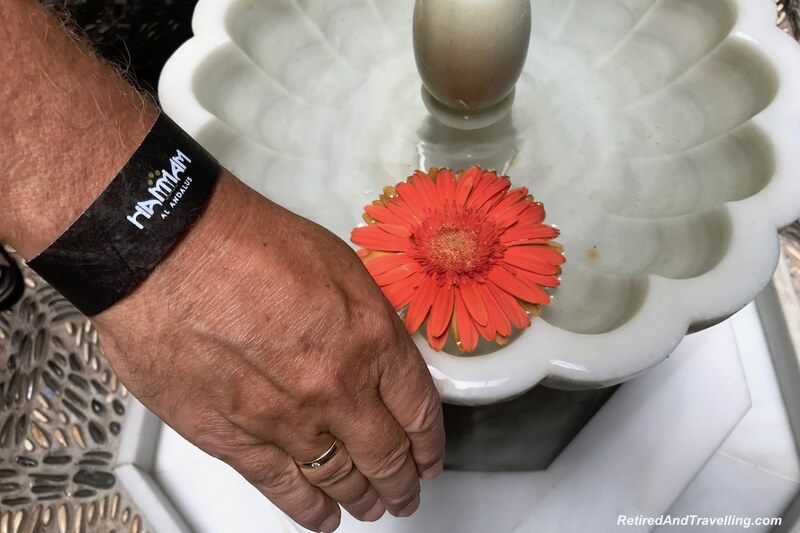 Our wristbands distinguished the services we were booked for. 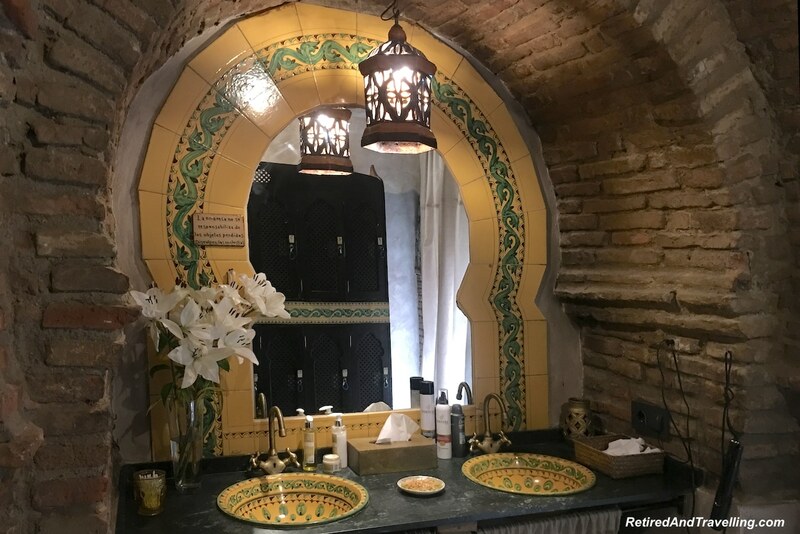 We arrived at the Hammam Al Ándalus in Cordoba and walked through the lower salon. 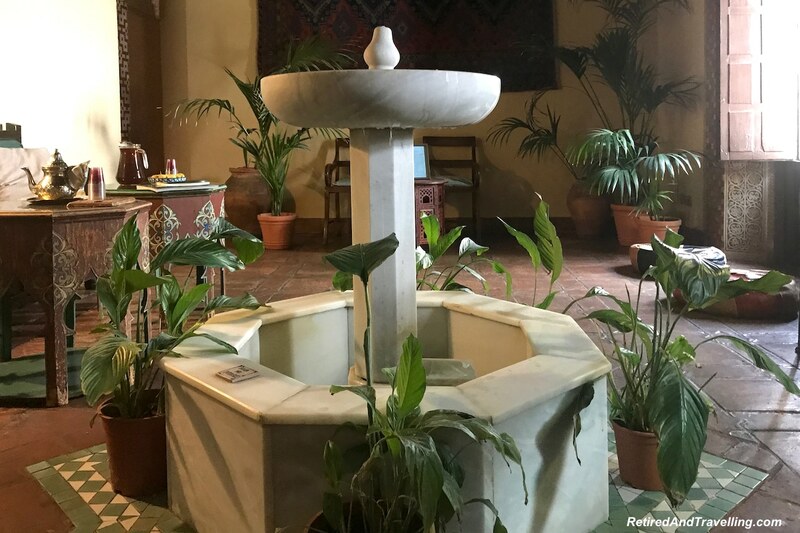 The decor was relaxing and the music chants calming. We were settled into a small quiet lounge with hot tea, water or a fruit drink. Our host Antonio arrived when it was our time to go in. 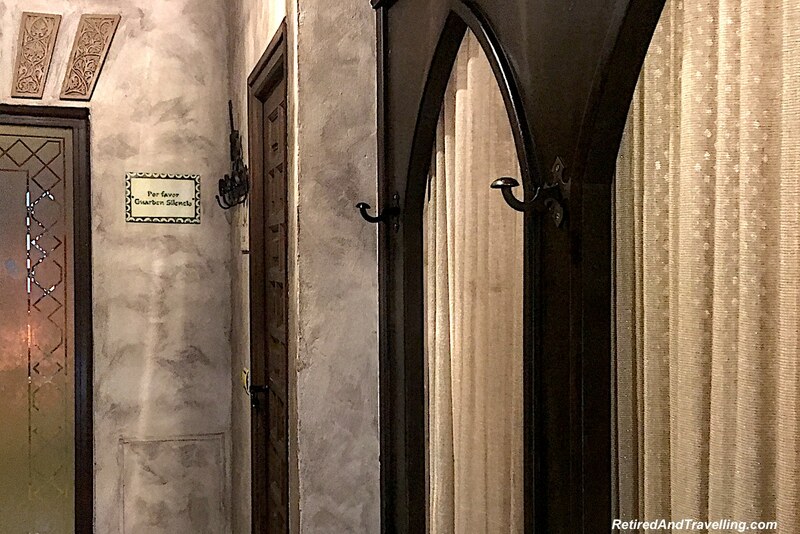 We were reminded that there were no cameras allowed in the treatment area so you will have to visualize our experience. 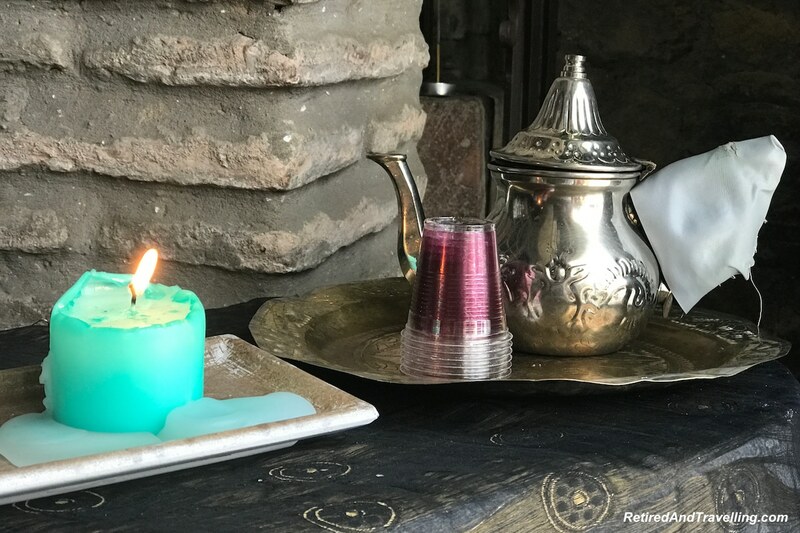 If you look at the link to the hammam I provided above you can see a video of the different types of services. We had 90 minutes for both the baths and our services. To start we were given booties to cover our shoes until we had showered. The booties reminded us of our visit inside the Taj Mahal. We went to our respective change rooms. Showered and in bathing suits we met up at the baths. I had read other public bath stories where bathing suits were not allowed. This was not one of them. We even kept our bathing suits on through the entire treatment. 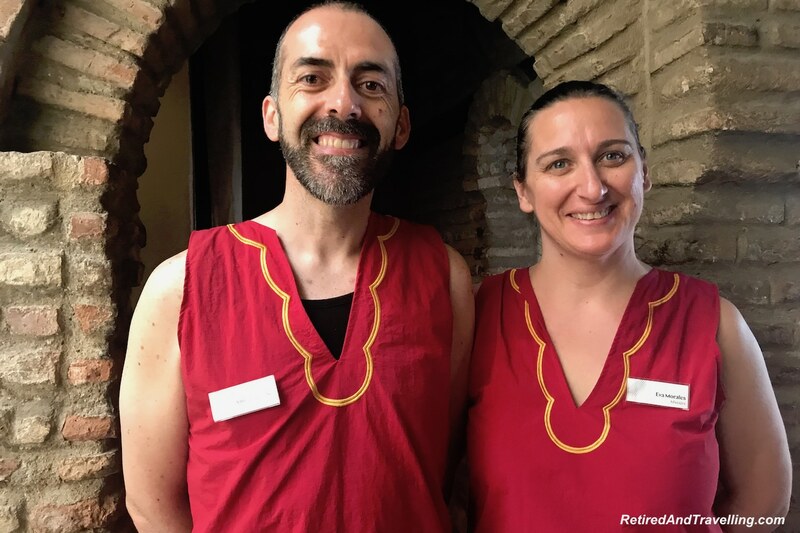 Antonio joined us and reminded us that there was to be silence in the baths. Several times Antonio had to come back and quiet down other people speaking in loud voices. We started at the hot bath. 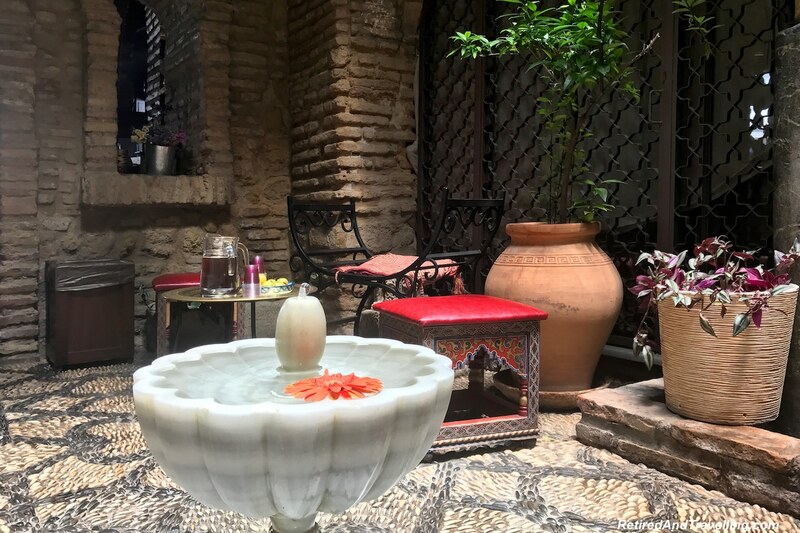 The warmth loosened muscles tense from all the walking we had done on the cobblestones in the old city. I floated peacefully. When I finally started to get too hot, I decided that I would try the cold baths. David just hung back to watch my face as my feet plunged in ice cold water. My feet were numb in seconds. Not to be deterred I put my full body in but only for a minute or two. David joined me. Then we were back to the hot baths. I needed to recover body heat. The next time I tried the warm bath. This was a much larger area and you could actually float around. It felt like it had less therapeutic value so I went back to alternating long soaks in the hot bath with short dunks in the cold bath. After 45 minutes I was totally relaxed and ready for my massage. Antonio took David first for his scrub on the hot stone. When I went in a few minutes later, I could see David on his table with water being poured over his body. The treatment rooms were separated from the baths but there were no curtains between the treatment rooms. I am sure most people were glad they kept their bathing suits on for the treatments. Several times I looked over to see David’s interesting treatment. After being wet down, a large pool of bubbles where put over his body. He said that the popping sound of the bubbles was an interesting feeling. After that he got scrubbed. We got to pick the scent we wanted for our massages. Lying on the table the masseuse moved from feet up to shoulders before having me turn over. While it was deemed to be a deep massage, it felt mostly relaxing. Tight muscles got relaxed. But I was used to a pretty deep tissue massage! We finished at about the same time and headed back to the showers. Our 90 minutes was up. We had started our day at our hotel with mimosas. It never failed to amaze me that the hotels in Portugal and Spain all had champagne and orange juice on their breakfast buffets. We visited the Mosque-Cathedral early in the morning and then took the rest of the day off from touring. 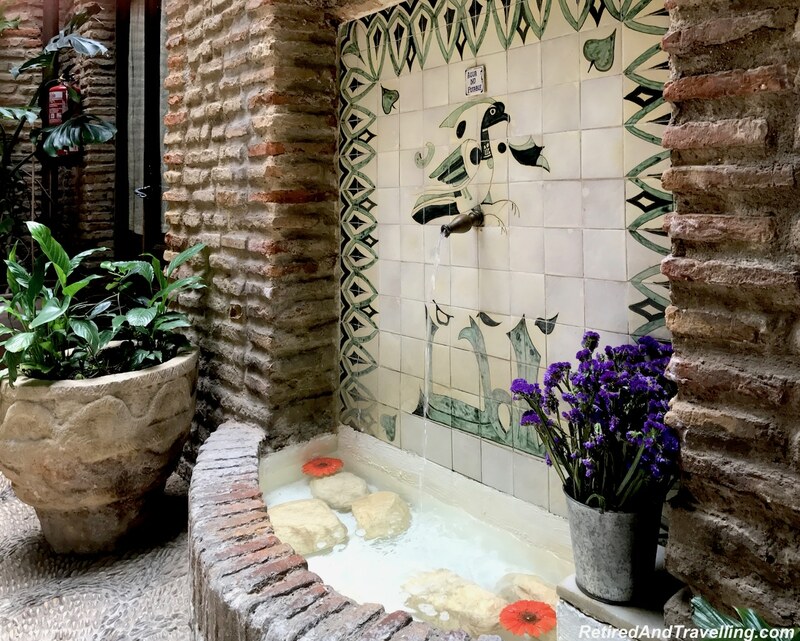 Our afternoon enjoying the baths at the hammam in Córdoba was a great way to spend our last afternoon in Córdoba! 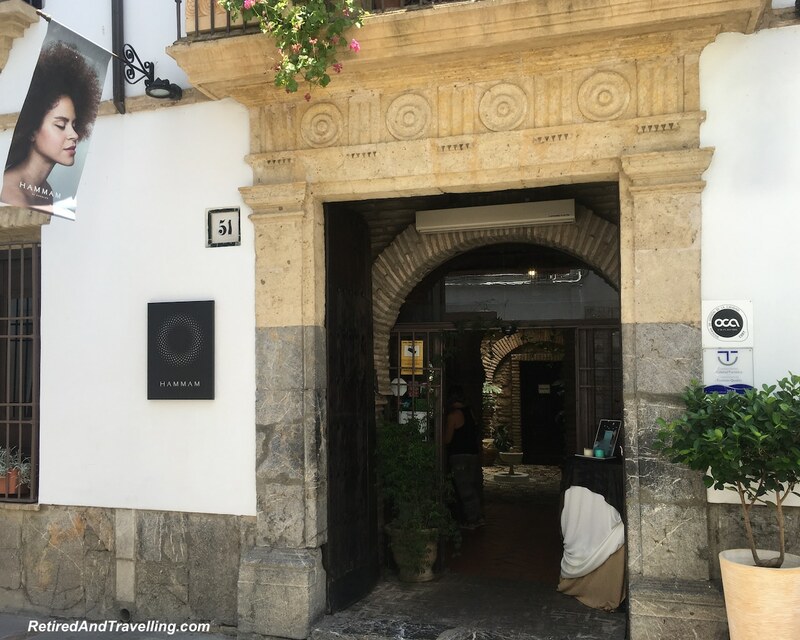 Have you tried the hammam in Córdoba or somewhere else in Spain? Did you do just the baths or did you add in other treatments?